For other uses, see Aztec (disambiguation). The Aztecs (/ˈæztɛks/) were a Mesoamerican culture that flourished in central Mexico in the post-classic period from 1300 to 1521. The Aztec peoples included different ethnic groups of central Mexico, particularly those groups who spoke the Nahuatl language and who dominated large parts of Mesoamerica from the 14th to the 16th centuries. Aztec culture was organized into city-states (altepetl), some of which joined to form alliances, political confederations, or empires. The Aztec empire was a confederation of three city-states established in 1427, Tenochtitlan, city-state of the Mexica or Tenochca; Texcoco; and Tlacopan, previously part of the Tepanec empire, whose dominant power was Azcapotzalco. Although the term Aztecs is often narrowly restricted to the Mexica of Tenochtitlan, it is also broadly used to refer to Nahua polities or peoples of central Mexico in the prehispanic era, as well as the Spanish colonial era (1521–1821). The definitions of Aztec and Aztecs have long been the topic of scholarly discussion, ever since German scientist Alexander von Humboldt established its common usage in the early nineteenth century. Most ethnic groups of central Mexico in the post-classic period shared basic cultural traits of Mesoamerica, and so many of the traits that characterize Aztec culture cannot be said to be exclusive to the Aztecs. For the same reason, the notion of "Aztec civilization" is best understood as a particular horizon of a general Mesoamerican civilization. The culture of central Mexico includes maize cultivation, the social division between nobility (pipiltin) and commoners (macehualtin), a pantheon (featuring Tezcatlipoca, Tlaloc and Quetzalcoatl), and the calendric system of a xiuhpohualli of 365 days intercalated with a tonalpohualli of 260 days. Particular to the Mexica of Tenochtitlan was the patron God Huitzilopochtli, twin pyramids, and the ceramic ware known as Aztec I to IV. From the 13th century, the Valley of Mexico was the heart of dense population and the rise of city-states. The Mexica were late-comers to the Valley of Mexico, and founded the city-state of Tenochtitlan on unpromising islets in Lake Texcoco, later becoming the dominant power of the Aztec Triple Alliance or Aztec Empire. It was a tributary empire that expanded its political hegemony far beyond the Valley of Mexico, conquering other city states throughout Mesoamerica in the late post-classic period. It originated in 1427 as an alliance between the city-states Tenochtitlan, Texcoco, and Tlacopan; these allied to defeat the Tepanec state of Azcapotzalco, which had previously dominated the Basin of Mexico. Soon Texcoco and Tlacopan were relegated to junior partnership in the alliance, with Tenochtitlan the dominant power. The empire extended its reach by a combination of trade and military conquest. It was never a true territorial empire controlling a territory by large military garrisons in conquered provinces, but rather dominated its client city-states primarily by installing friendly rulers in conquered territories, by constructing marriage alliances between the ruling dynasties, and by extending an imperial ideology to its client city-states. Client city-states paid tribute to the Aztec emperor, the Huey Tlatoani, in an economic strategy limiting communication and trade between outlying polities, making them dependent on the imperial center for the acquisition of luxury goods. The political clout of the empire reached far south into Mesoamerica conquering polities as far south as Chiapas and Guatemala and spanning Mesoamerica from the Pacific to the Atlantic oceans. The empire reached its maximal extent in 1519, just prior to the arrival of a small group of Spanish conquistadors led by Hernán Cortés. Cortés allied with city-states opposed to the Mexica, particularly the Nahuatl-speaking Tlaxcalteca as well as other central Mexican polities, including Texcoco, its former ally in the Triple Alliance. After the fall of Tenochtitlan on August 13, 1521 and the capture of the emperor Cuauhtemoc, the Spanish founded Mexico City on the ruins of Tenochtitlan. From there they proceeded with the process of conquest and incorporation of Mesoamerican peoples into the Spanish Empire. With the destruction of the superstructure of the Aztec Empire in 1521, the Spanish utilized the city-states on which the Aztec Empire had been built, to rule the indigenous populations via their local nobles. Those nobles pledged loyalty to the Spanish crown and converted, at least nominally, to Christianity, and in return were recognized as nobles by the Spanish crown. Nobles acted as intermediaries to convey tribute and mobilize labor for their new overlords, facilitating the establishment of Spanish colonial rule. Aztec culture and history is primarily known through archaeological evidence found in excavations such as that of the renowned Templo Mayor in Mexico City; from indigenous writings; from eyewitness accounts by Spanish conquistadors such as Cortés and Bernal Díaz del Castillo; and especially from 16th- and 17th-century descriptions of Aztec culture and history written by Spanish clergymen and literate Aztecs in the Spanish or Nahuatl language, such as the famous illustrated, bilingual (Spanish and Nahuatl), twelve-volume Florentine Codex created by the Franciscan friar Bernardino de Sahagún, in collaboration with indigenous Aztec informants. Important for knowledge of post-conquest Nahuas was the training of indigenous scribes to write alphabetic texts in Nahuatl, mainly for local purposes under Spanish colonial rule. At its height, Aztec culture had rich and complex mythological and religious traditions, as well as achieving remarkable architectural and artistic accomplishments. The Nahuatl words (aztecatl [asˈtekat͡ɬ], singular) and (aztecah [asˈtekaʔ], plural) mean "people from Aztlan," a mythical place of origin for several ethnic groups in central Mexico. The term was not used as an endonym by Aztecs themselves, but it is found in the different migration accounts of the Mexica, where it describes the different tribes who left Aztlan together. In one account of the journey from Aztlan, Huitzilopochtli, the tutelary deity of the Mexica tribe, tells his followers on the journey that "now, no longer is your name Azteca, you are now Mexitin [Mexica]". Sometimes the term also includes the inhabitants of Tenochtitlan's two principal allied city-states, the Acolhuas of Texcoco and the Tepanecs of Tlacopan, who together with the Mexica formed the Aztec Triple Alliance that controlled what is often known as the "Aztec Empire." The usage of the term "Aztec" in describing the empire centered in Tenochtitlan, has been criticized by Robert H. Barlow who preferred the term "Culhua-Mexica", and by Pedro Carrasco who prefers the term "Tenochca empire." Carrasco writes about the term "Aztec" that "it is of no use for understanding the ethnic complexity of ancient Mexico and for identifying the dominant element in the political entity we are studying." When used to describe ethnic groups, the term "Aztec" refers to several Nahuatl-speaking peoples of central Mexico in the postclassic period of Mesoamerican chronology, especially the Mexica, the ethnic group that had a leading role in establishing the hegemonic empire based at Tenochtitlan. The term extends to further ethnic groups associated with the Aztec empire, such as the Acolhua, the Tepanec and others that were incorporated into the empire. Charles Gibson enumerates a number of groups in central Mexico that he includes in his study The Aztecs Under Spanish Rule (1964). These include the Culhuaque, Cuitlahuaque, Mixquica, Xochimilca, Chalca, Tepaneca, Acolhuaque, and Mexica. In older usage the term was commonly used about modern Nahuatl-speaking ethnic groups, as Nahuatl was previously referred to as the "Aztec language". In recent usage, these ethnic groups are referred to as the Nahua peoples. Linguistically, the term "Aztecan" is still used about the branch of the Uto-Aztecan languages (also sometimes called the yuto-nahuan languages) that includes the Nahuatl language and its closest relatives Pochutec and Pipil. To the Aztecs themselves the word "aztec" was not an endonym for any particular ethnic group. Rather, it was an umbrella term used to refer to several ethnic groups, not all of them Nahuatl-speaking, that claimed heritage from the mythic place of origin, Aztlan. Alexander von Humboldt originated the modern usage of "Aztec" in 1810, as a collective term applied to all the people linked by trade, custom, religion, and language to the Mexica state and the Triple Alliance. In 1843, with the publication of the work of William H. Prescott on the history of the conquest of Mexico, the term was adopted by most of the world, including 19th-century Mexican scholars who saw it as a way to distinguish present-day Mexicans from pre-conquest Mexicans. This usage has been the subject of debate in more recent years, but the term "Aztec" is still more common. Knowledge of Aztec society rests on several different sources: The many archeological remains of everything from temple pyramids to thatched huts, can be used to understand many of the aspects of what the Aztec world was like. However, archeologists often must rely on knowledge from other sources to interpret the historical context of artifacts. There are many written texts by indigenous and Spaniards of the early colonial period that contain invaluable information about precolonial Aztec history. These texts provide insight into the political histories of various Aztec city-states, and their ruling lineages. Such histories were produced as well in pictorial codices. Some of these manuscripts were entirely pictorial, often with glyphs. In the postconquest era many other texts were written in Latin script by either literate Aztecs or by Spanish friars who interviewed the native people about their customs and stories. An important pictorial and alphabetic text produced in the early sixteenth century was Codex Mendoza, named after the first viceroy of Mexico and perhaps commissioned by him, to inform the Spanish crown about the political and economic structure of the Aztec empire. It has information naming the polities that the Triple Alliance conquered, the types of tribute rendered to the Aztec Empire, and the class/gender structure of their society. Many written annals exist, written by local Nahua historians recording the histories of their polity. These annals used pictorial histories and were subsequently transformed into alphabetic annals in Latin script. Well-known native chroniclers and annalists are Chimalpahin of Amecameca-Chalco; Fernando Alvarado Tezozomoc of Tenochtitlan; Alva Ixtlilxochitl of Texcoco, Juan Bautista Pomar of Texcoco, and Diego Muñoz Camargo of Tlaxcala. There are also many accounts by Spanish conquerors who participated in Spanish invasion, such as Bernal Díaz del Castillo who wrote a full history of the conquest. Spanish friars also produced documentation in chronicles and other types of accounts. Of key importance is Toribio de Benavente Motolinia, one of the first twelve Franciscans arriving in Mexico in 1524. Another Franciscan of great importance was Fray Juan de Torquemada, author of Monarquia Indiana. Dominican Diego Durán also wrote extensively about prehispanic religion as well as a history of the Mexica. An invaluable source of information about many aspects of Aztec religious thought, political and social structure, as well as history of the Spanish conquest from the Mexica viewpoint is the Florentine Codex. 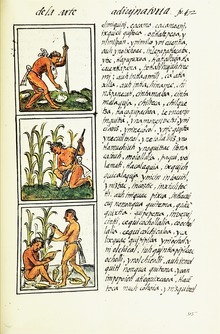 Produced between 1545–1576 in the form of an ethnographic encyclopedia written bilingually in Spanish and Nahuatl, by Franciscan friar Bernardino de Sahagún and indigenous informants and scribes, it contains knowledge about many aspects of precolonial society from religion, calendrics, botany, zoology, trades and crafts and history. Another source of knowledge is the cultures and customs of the contemporary Nahuatl speakers who can often provide insights into what prehispanic ways of life may have been like. Scholarly study of Aztec civilization is most often based on scientific and multidisciplinary methodologies, combining archeological knowledge with ethnohistorical and ethnographic information. It is a matter of debate whether the enormous city of Teotihuacan was inhabited by speakers of Nahuatl, or whether Nahuas had not yet arrived in central Mexico in the classic period. It is generally agreed that the Nahua peoples were not indigenous to the highlands of central Mexico, but that they gradually migrated into the region from somewhere in northwestern Mexico. At the fall of Teotihuacan in the 6th century CE, a number of city states rose to power in central Mexico, some of them, including Cholula and Xochicalco, probably inhabited by Nahuatl speakers. One study has suggested that Nahuas originally inhabited the Bajío area around Guanajuato which reached a population peak in the 6th century, after which the population quickly diminished during a subsequent dry period. This depopulation of the Bajío coincided with an incursion of new populations into the Valley of Mexico, which suggests that this marks the influx of Nahuatl speakers into the region. These people populated central Mexico, dislocating speakers of Oto-Manguean languages as they spread their political influence south. As the former nomadic hunter-gatherer peoples mixed with the complex civilizations of Mesoamerica, adopting religious and cultural practices, the foundation for later Aztec culture was laid. After 900 CE, during the postclassic period, a number of sites almost certainly inhabited by Nahuatl speakers became powerful. Among them the site of Tula, Hidalgo, and also city states such as Tenayuca, and Colhuacan in the valley of Mexico and Cuauhnahuac in Morelos. According to Aztec legend, in 1323, the Mexica were shown a vision of an eagle perched on a prickly pear cactus, eating a snake. The vision indicated the location where they were to build their settlement. The Mexica founded Tenochtitlan on a small swampy island in Lake Texcoco, the inland lake of the Basin of Mexico. The year of foundation is usually given as 1325. In 1376 the Mexica royal dynasty was founded when Acamapichtli, son of a Mexica father and a Colhua mother, was elected as the first Huey Tlatoani of Tenochtitlan. In 1440, Motecuzoma I Ilhuicamina[nb 4] (lit. "he frowns like a lord, he shoots the sky"[nb 5]) was elected tlatoani; he was son of Huitzilihhuitl, brother of Chimalpopoca and had served as the war leader of his uncle Itzcoatl in the war against the Tepanecs. The accession of a new ruler in the dominant city state was often an occasion for subjected cities to rebel by refusing to pay tribute. This meant that new rulers began their rule with a coronation campaign, often against rebellious tributaries, but also sometimes demonstrating their military might by making new conquests. Motecuzoma tested the attitudes of the cities around the valley by requesting laborers for the enlargement of the Great Temple of Tenochtitlan. Only the city of Chalco refused to provide laborers, and hostilities between Chalco and Tenochtitlan would persist until the 1450s. Motecuzoma then reconquered the cities in the valley of Morelos and Guerrero, and then later undertook new conquests in the Huaxtec region of northern Veracruz, and the Mixtec region of Coixtlahuaca and large parts of Oaxaca, and later again in central and southern Veracruz with conquests at Cosamalopan, Ahuilizapan and Cuetlaxtlan. During this period the city states of Tlaxcalan, Cholula and Huexotzinco emerged as major competitors to the imperial expansion, and they supplied warriors to several of the cities conquered. Motecuzoma therefore initiated a state of low-intensity warfare against these three cities, staging minor skirmishes called "Flower Wars" (Nahuatl xochiyaoyotl) against them, perhaps as a strategy of exhaustion. In 1469, the next ruler was Axayacatl (lit. "Water mask"), son of Itzcoatl's son Tezozomoc and Motecuzoma I's daughter Atotoztli. [nb 6] He undertook a successful coronation campaign far south of Tenochtitlan against the Zapotecs in the Isthmus of Tehuantepec. Axayacatl also conquered the independent Mexica city of Tlatelolco, located on the northern part of the island where Tenochtitlan was also located. The Tlatelolca ruler Moquihuix was married to Axayacatl's sister, and his alleged mistreatment of her was used as an excuse to incorporate Tlatelolco and its important market directly under the control of the tlatoani of Tenochtitlan. Axayacatl then conquered areas in Central Guerrero, the Puebla Valley, on the gulf coast and against the Otomi and Matlatzinca in the Toluca valley. The Toluca valley was a buffer zone against the powerful Tarascan state in Michoacan, against which Axayacatl turned next. In the major campaign against the Tarascans (Nahuatl languages: Michhuahqueh) in 1478–79 the Aztec forces were repelled by a well organized defense. Axayacatl was soundly defeated in a battle at Tlaximaloyan (today Tajimaroa), losing most of his 32,000 men and only barely escaping back to Tenochtitlan with the remnants of his army. In 1481 at Axayacatls death, his older brother Tizoc was elected ruler. Tizoc's coronation campaign against the Otomi of Metztitlan failed as he lost the major battle and only managed to secure 40 prisoners to be sacrificed for his coronation ceremony. Having shown weakness, many of the tributary towns rebelled and consequently most of Tizoc's short reign was spent attempting to quell rebellions and maintain control of areas conquered by his predecessors. Tizoc died suddenly in 1485, and it has been suggested that he was poisoned by his brother and war leader Ahuitzotl who became the next tlatoani. Tizoc is mostly known as the namesake of the Stone of Tizoc a monumental sculpture (Nahuatl temalacatl), decorated with representation of Tizoc's conquests. Moctezuma II Xocoyotzin is known to world history as the Aztec ruler when the Spanish invaders and their indigenous allies began their conquest of the empire in a two-year-long campaign (1519–1521). His early rule did not hint at his future fame. He succeeded to the rulership after the death of Ahuitzotl. Moctezuma Xocoyotzin (lit. "He frowns like a lord, the youngest child"), was a son of Axayacatl, and a war leader. He began his rule in standard fashion, conducting a coronation campaign to demonstrate his skills as a leader. He attacked the fortified city of Nopallan in Oaxaca and subjected the adjacent region to the empire. An effective warrior, Moctezuma maintained the pace of conquest set by his predecessor and subjected large areas in Guerrero, Oaxaca, Puebla and even far south along the Pacific and Gulf coasts, conquering the province of Xoconochco in Chiapas. he also intensified the flower wars waged against Tlaxcala and Huexotzinco, and secured an alliance with Cholula. He also consolidated the class structure of Aztec society, by making it harder for commoners (Nahuatl languages: macehualtin) to accede to the privileged class of the pipiltin through merit in combat. He also instituted a strict sumptuary code limiting the types of luxury goods that could be consumed by commoners. In 1517, Moctezuma received the first news of ships with strange warriors having landed on the Gulf Coast near Cempoallan and he dispatched messengers to greet them and find out what was happening, and he ordered his subjects in the area to keep him informed of any new arrivals. In 1519, he was informed of the arrival of the Spanish fleet of Hernán Cortés, who soon marched towards Tlaxcala where he formed an alliance with the traditional enemies of the Aztecs. On November 8, 1519, Motecuzoma II received Cortés and his troops and Tlaxcalan allies on the causeway south of Tenochtitlan, and he invited the Spaniards to stay as his guests in Tenochtitlan. When Aztec troops destroyed a Spanish camp on the gulf coast, Cortés ordered Motecuzoma to execute the commanders responsible for the attack, and Motecuzoma complied. At this point, the power balance had shifted towards the Spaniards who now held Motecuzoma as a prisoner in his own palace. As this shift in power became clear to Motecuzoma's subjects, the Spaniards became increasingly unwelcome in the capital city, and in June 1520, hostilities broke out, culminating in the massacre in the Great Temple, and a major uprising of the Mexica against the Spanish. During the fighting, Moctezuma was killed, either by the Spaniards who killed him as they fled the city or by the Mexica themselves who considered him a traitor. Folio from the Codex Mendoza showing a commoner advancing through the ranks by taking captives in war. Each attire can be achieved by taking a certain number of captives. The highest class were the pīpiltin[nb 7] or nobility. The pilli status was hereditary and ascribed certain privileges to its holder, such as the right to wear particularly fine garments and consume luxury goods, as well as to own land and direct corvée labor by commoners. The most powerful nobles were called lords (Nahuatl languages: teuctin) and they owned and controlled noble estates or houses, and could serve in the highest government positions or as military leaders. Nobles made up about 5% of the population. In the valley of Morelos, archeologist Michael E. Smith estimates that a typical altepetl had from 10,000 to 15,000 inhabitants, and covered an area between 70 and 100 square kilometers. In the Morelos valley, altepetl sizes were somewhat smaller. Smith argues that the altepetl was primarily a political unit, made up of the population with allegiance to a lord, rather than as a territorial unit. He makes this distinction because in some areas minor settlements with different altepetl allegiances were interspersed. The Aztec Empire was ruled by indirect means. Like most European empires, it was ethnically very diverse, but unlike most European empires, it was more of a system of tribute than a single system of government. Ethnohistorian Ross Hassig has argued that Aztec empire is best understood as an informal or hegemonic empire because it did not exert supreme authority over the conquered lands; it merely expected tributes to be paid and exerted force only to the degree it was necessary to ensure the payment of tribute. It was also a discontinuous empire because not all dominated territories were connected; for example, the southern peripheral zones of Xoconochco were not in direct contact with the center. The hegemonic nature of the Aztec empire can be seen in the fact that generally local rulers were restored to their positions once their city-state was conquered, and the Aztecs did not generally interfere in local affairs as long as the tribute payments were made and the local elites participated willingly. Such compliance was secured by establishing and maintaining a network of elites, related through intermarriage and different forms of exchange. The excess supply of food products allowed a significant portion of the Aztec population to dedicate themselves to trades other than food production. Apart from taking care of domestic food production, women weaved textiles from agave fibers and cotton. Men also engaged in craft specializations such as the production of ceramics and of obsidian and flint tools, and of luxury goods such as beadwork, featherwork and the elaboration of tools and musical instruments. Sometimes entire calpollis specialized in a single craft, and in some archeological sites large neighborhoods have been found where apparently only a single craft speciality was practiced. The Aztecs did not produce much metal work, but did have knowledge of basic smelting technology for gold, and they combined gold with precious stones such as jade and turquoise. Copper products were generally imported from the Tarascans of Michoacan. The pochteca were specialized long distance merchants organized into exclusive guilds. They made long expeditions to all parts of Mesoamerica bringing back exotic luxury goods, and they served as the judges and supervisors of the Tlatelolco market. Although the economy of Aztec Mexico was commercialized (in its use of money, markets, and merchants), land and labor were not generally commodities for sale, though some types of land could be sold between nobles. In the commercial sector of the economy, several types of money were in regular use. Small purchases were made with cacao beans, which had to be imported from lowland areas. In Aztec marketplaces, a small rabbit was worth 30 beans, a turkey egg cost 3 beans, and a tamal cost a single bean. For larger purchases, standardized lengths of cotton cloth, called quachtli, were used. There were different grades of quachtli, ranging in value from 65 to 300 cacao beans. About 20 quachtli could support a commoner for one year in Tenochtitlan. Another form of distribution of goods was through the payment of tribute. When an altepetl was conquered, the victor imposed a yearly tribute, usually paid in the form of whichever local product was most valuable or treasured. Several pages from the Codex Mendoza list tributary towns along with the goods they supplied, which included not only luxuries such as feathers, adorned suits, and greenstone beads, but more practical goods such as cloth, firewood, and food. Tribute was usually paid twice or four times a year at differing times. Aztec society combined a relatively simple agrarian rural tradition with the development of a truly urbanized society with a complex system of institutions, specializations and hierarchies. The urban tradition in Mesoamerica was developed during the classic period with major urban centers such as Teotihuacan with a population well above 100,000, and at the time of the rise of the Aztec, the urban tradition was ingrained in Mesoamerican society, with urban centers serving major religious, political and economic functions for the entire population. The capital city of the Aztec empire was Tenochtitlan, now the site of modern-day Mexico City. Built on a series of islets in Lake Texcoco, the city plan was based on a symmetrical layout that was divided into four city sections called campan (directions). Tenochtitlan was built according to a fixed plan and centered on the ritual precinct, where the Great Pyramid of Tenochtitlan rose 50 m (164.04 ft) above the city. Houses were made of wood and loam, roofs were made of reed, although pyramids, temples and palaces were generally made of stone. The city was interlaced with canals, which were useful for transportation. Anthropologist Eduardo Noguera estimated the population at 200,000 based on the house count and merging the population of Tlatelolco (once an independent city, but later became a suburb of Tenochtitlan). If one includes the surrounding islets and shores surrounding Lake Texcoco, estimates range from 300,000 to 700,000 inhabitants. Michael E. Smith gives a somewhat smaller figure of 212,500 inhabitants of Tenochtitlan based on an area of 1,350 hectares (3,300 acres) and a population density of 157 inhabitants per hectare. The second largest city in the valley of Mexico in the Aztec period was Texcoco with some 25,000 inhabitants dispersed over 450 hectares (1,100 acres). The centerpiece of Tenochtitlan was the Templo Mayor, the Great Temple, a large stepped pyramid with a double staircase leading up to two twin shrines – one dedicated to Tlaloc, the other to Huitzilopochtli. This was where most of the human sacrifices were carried out during the ritual festivals and the bodies of sacrificial victims were thrown down the stairs. The temple was enlarged in several stages, and most of the Aztec rulers made a point of adding a further stage, each with a new dedication and inauguration. The temple has been excavated in the center of Mexico City and the rich dedicatory offerings are displayed in the Museum of the Templo Mayor. Archaeologist Eduardo Matos Moctezuma, in his essay Symbolism of the Templo Mayor, posits that the orientation of the temple is indicative of the totality of the vision the Mexica had of the universe (cosmovision). He states that the "principal center, or navel, where the horizontal and vertical planes intersect, that is, the point from which the heavenly or upper plane and the plane of the Underworld begin and the four directions of the universe originate, is the Templo Mayor of Tenochtitlan." Matos Moctezuma supports his supposition by claiming that the temple acts as an embodiment of a living myth where "all sacred power is concentrated and where all the levels intersect." The main deities worshipped by the Aztecs were Tlaloc, a rain and storm deity, Huitzilopochtli a solar and martial deity and the tutelary deity of the Mexica tribe, Quetzalcoatl, a wind, sky and star deity and cultural hero, Tezcatlipoca, a deity of the night, magic, prophecy and fate. The Great Temple in Tenochtitlan had two shrines on its top, one dedicated to Tlaloc, the other to Huitzilopochtli. Quetzalcoatl and Tezcatlipoca each had separate temples within the religious precinct close to the Great Temple, and the high priests of the Great Temple were named “Quetzalcoatl Tlamacazqueh”. Other major deities were Tlaltecutli or Coatlicue a female earth deity, the deity couple Tonacatecuhtli and Tonacacihuatl were associated with life and sustenance, Mictlantecutli and Mictlancihuatl, a male/female couple of deities of the underworld and death, Chalchiutlicue, a female deity of lakes and springs, Xipe Totec, a deity of fertility and the natural cycle, Huehueteotl or Xiuhtecuhtli a fire god, Tlazolteotl a female deity tied to childbirth and sexuality, and a Xochipilli and Xochiquetzal gods of song, dance and games. In some regions, particularly Tlaxcala, Mixcoatl or Camaxtli was the main tribal deity. A few sources mention a deity Ometeotl who may have been a god of the duality between life and death, male and female and who may have incorporated Tonacatecuhtli and Tonacacihuatl. Apart from the major deities there were dozens of minor deities each associated with an element or concept, and as the Aztec empire grew so did their pantheon because they adopted and incorporated the local deities of conquered people into their own. Additionally the major gods had many alternative manifestations or aspects, creating small families of gods with related aspects. In another myth of how the earth was created, Tezcatlipoca and Quetzalcoatl appear as allies, defeating a giant crocodile Cipactli and requiring her to become the earth, allowing humans to carve into her flesh and plant their seeds, on the condition that in return they will offer blood to her. And in the story of the creation of humanity, Quetzalcoatl travels with his twin Xolotl to the underworld and brings back bones which are then ground like corn on a metate by the goddess Cihuacoatl, the resulting dough is given human form and comes to life when Quetzalcoatl imbues it with his own blood. Huitzilopochtli is the deity tied to the Mexica tribe and he figures in the story of the origin and migrations of the tribe. On their journey, Huitzilopochtli, in the form of a deity bundle carried by the Mexica priest, continuously spurs the tribe on by pushing them into conflict with their neighbors whenever they are settled in a place. In another myth, Huitzilopochtli defeats and dismembers his sister the lunar deity Coyolxauhqui and her four hundred brothers at the hill of Coatepetl. The southern side of the Great Temple, also called Coatepetl, was a representation of this myth and at the foot of the stairs lay a large stone monolith carved with a representation of the dismembered goddess. The "Aztec calendar stone" or "Sun Stone", a large stone monolith unearthed in 1790 in Mexico City depicting the five eras of Aztec mythical history, with calendric images. Aztec religious life was organized around the calendars. As most Mesoamerican people, the Aztecs used two calendars simultaneously: a ritual calendar of 260 days called the tonalpohualli and a solar calendar of 365 days called the xiuhpohualli. Each day had a name and number in both calendars, and the combination of two dates were unique within a period of 52 years. The tonalpohualli was mostly used for divinatory purposes and it consisted of 20 day signs and number coefficients of 1–13 that cycled in a fixed order. The xiuhpohualli was made up of 18 “months” of 20 days, and with a remainder of 5 “void” days at the end of a cycle before the new xiuhpohualli cycle began. Each 20-day month was named after the specific ritual festival that began the month, many of which contained a relation to the agricultural cycle. Whether, and how, the Aztec calendar corrected for leap year is a matter of discussion among specialists. The monthly rituals involved the entire population as rituals were performed in each household, in the calpolli temples and in the main sacred precinct. Many festivals involved different forms of dancing, as well as the reenactment of mythical narratives by deity impersonators and the offering of sacrifice, in the form of food, animals and human victims. Every 52 years, the two calendars reached their shared starting point and a new calendar cycle began. This calendar event was celebrated with a ritual known as Xiuhmolpilli or the New Fire Ceremony. In this ceremony, old pottery was broken in all homes and all fires in the Aztec realm were put out. Then a new fire was drilled over the breast of a sacrificial victim and runners brought the new fire to the different calpolli communities where fire was redistributed to each home. The night without fire was associated with the fear that star demons, tzitzimime, might descend and devour the earth – ending the fifth period of the sun. While human sacrifice was practiced throughout Mesoamerica, the Aztecs, according to their own accounts, brought this practice to an unprecedented level. For example, for the reconsecration of the Great Pyramid of Tenochtitlan in 1487, the Aztecs reported that they sacrificed 80,400 prisoners over the course of four days, reportedly by Ahuitzotl, the Great Speaker himself. This number, however, is not universally accepted and may have been exaggerated. The scale of Aztec human sacrifice has provoked many scholars to consider what may have been the driving factor behind this aspect of Aztec religion. In the 1970s, Michael Harner and Marvin Harris argued that the motivation behind human sacrifice among the Aztecs was actually the cannibalization of the sacrificial victims, depicted for example in Codex Magliabechiano. Harner claimed that very high population pressure and an emphasis on maize agriculture, without domesticated herbivores, led to a deficiency of essential amino acids among the Aztecs. While there is universal agreement that the Aztecs practiced sacrifice, there is a lack of scholarly consensus as to whether cannibalism was widespread. Harris, author of Cannibals and Kings (1977), has propagated the claim, originally proposed by Harner, that the flesh of the victims was a part of an aristocratic diet as a reward, since the Aztec diet was lacking in proteins. These claims have been refuted by Bernard Ortíz Montellano who, in his studies of Aztec health, diet, and medicine, demonstrates that while the Aztec diet was low in animal proteins, it was rich in vegetable proteins. Ortiz also points to the preponderance of human sacrifice during periods of food abundance following harvests compared to periods of food scarcity, the insignificant quantity of human protein available from sacrifices and the fact that aristocrats already had easy access to animal protein. Today many scholars point to ideological explanations of the practice, noting how the public spectacle of sacrificing warriors from conquered states was a major display of political power, supporting the claim of the ruling classes to divine authority. It also served as an important deterrent against rebellion by subjugated polities against the Aztec state, and such deterrents were crucial in order for the loosely organized empire to cohere. The image to right demonstrates the use of phonetic signs for writing place names in the colonial Aztec Codex Mendoza. The uppermost place is "Mapachtepec", meaning literally "On the Hill of the Raccoon ", but the glyph includes the phonetic signs "MA" (hand) and "PACH" (moss) over a mountain "TEPETL" spelling the word "mapach" ("raccoon") phonetically instead of logographically. The other two place names, Mazatlan ("Place of Many Deer") and Huitztlan ("Place of many thorns"), use the phonetic element "TLAN" represented by a tooth (tlantli) combined with a deer head to spell "MAZA" (mazatl = deer) and a thorn (huitztli) to spell "HUITZ". A remarkable amount of this poetry survives, having been collected during the era of the conquest. In some cases poetry is attributed to individual authors, such as Nezahualcoyotl, tlatoani of Texcoco, and Cuacuauhtzin, Lord of Tepechpan, but whether these attributions reflect actual authorship is a matter of opinion. Important collection of such poems are Romances de los señores de la Nueva España, collected (Tezcoco 1582), probably by Juan Bautista de Pomar,[nb 8] and the Cantares Mexicanos. Aztec painted art was produced on animal skin (mostly deer), on cotton lienzos and on amate paper made from bark (e.g. from Trema micrantha or Ficus aurea), it was also produced on ceramics and carved in wood and stone. The surface of the material was often first treated with gesso to make the images stand out more clearly. The art of painting and writing was known in Nahuatl by the metaphor in tlilli, in tlapalli - meaning "the black ink, the red pigment". There are few extant Aztec painted books. Of these none are conclusively confirmed to have been created before the conquest, but several codices must have been painted either right before the conquest or very soon after - before traditions for producing them were much disturbed. Even if some codices may have been produced after the conquest, there is good reason to think that they may have been copied from pre-Columbian originals by scribes. The Codex Borbonicus is considered by some to be the only extant Aztec codex produced before the conquest - it is a calendric codex describing the day and month counts indicating the patron deities of the different time periods. Others consider it to have stylistic traits suggesting a post-conquest production. Some codices were produces post-conquest, sometimes commissioned by the colonial government, for example Codex Mendoza, were painted by Aztec tlacuilos (codex creators), but under the control of Spanish authorities, who also sometimes commissioned codices describing pre-colonial religious practices, for example Codex Ríos. After the conquest, codices with calendric or religious information were sought out and systematically destroyed by the church - whereas other types of painted books, particularly historical narratives and tribute lists continued to be produced. Although depicting Aztec deities and describing religious practices also shared by the Aztecs of the Valley of Mexico, the codices produced in Southern Puebla near Cholula, are sometimes not considered to be Aztec codices, because they were produced outside of the Aztec "heartland". Karl Anton Nowotny, nevertheless considered that the Codex Borgia, painted in the area around Cholula and using a Mixtec style, was the "most significant work of art among the extant manuscripts". The Coatlicue statue in the National Museum of Anthropology. In Aztec artwork a number of monumental stone sculptures have been preserved, such sculptures usually functioned as adornments for religious architecture. Particularly famous monumental rock sculpture includes the so-called Aztec "Sunstone" or Calendarstone discovered in 1790; also discovered in 1790 excavations of the Zócalo was the 2.7 meter tall Coatlicue statue made of andesite, representing a serpentine chthonic goddess with a skirt made of rattlesnakes. The Coyolxauhqui Stone representing the dismembered goddess Coyolxauhqui, found in 1978, was at the foot of the staircase leading up to the Great Temple in Tenochtitlan. Two important types of sculpture are unique to the Aztecs, and related to the context of ritual sacrifice: the cuauhxicalli or "eagle vessel", large stone bowls often shaped like eagles or jaguars used as a receptacle for extracted human hearts; the temalacatl, a monumental carved stone disk to which war captives were tied and sacrificed in a form of gladiatorial combat. The most well known examples of this type of sculpture are the Stone of Tizoc and the Stone of Motecuzoma I, both carved with images of warfare and conquest by specific Aztec rulers. Many smaller stone sculptures depicting deities also exist. The style used in religious sculpture was rigid stances likely meant to create a powerful experience in the onlooker. Although Aztec stone sculptures are now displayed in museums as unadorned rock, they were originally painted in vivid polychrome color, sometimes covered first with a base coat of plaster. Early Spanish conquistador accounts also describe stone sculptures as having been decorated with precious stones and metal, inserted into the plaster. Mexico City was built on the ruins of Tenochtitlan, gradually replacing and covering the lake, the island and the architecture of Aztec Tenochtitlan. After the fall of Tenochtitlan, Aztec warriors were enlisted as auxiliary troops alongside the Spanish Tlaxcalteca allies, and Aztec forces participated in all of the subsequent campaigns of conquest in northern and southern Mesoamerica. This meant that aspects of Aztec culture and the Nahuatl language continued to expand during the early colonial period as Aztec auxiliary forces made permanent settlements in many of the areas that were put under the Spanish crown. The Aztec ruling dynasty continued to govern the indigenous polity of San Juan Tenochtitlan, a division of the Spanish capital of Mexico City, but the subsequent indigenous rulers were mostly puppets installed by the Spanish. One was Andrés de Tapia Motelchiuh, who was appointed by the Spanish. Other former Aztec city states likewise were established as colonial indigenous towns, governed by a local indigenous gobernador. This office was often initially held by the hereditary indigenous ruling line, with the gobernador being the tlatoani, but the two positions in many Nahua towns became separated over time. Indigenous governors were in charge of the colonial political organization of the Indians. In particular they enabled the continued functioning of the tribute and obligatory labor of commoner Indians to benefit the Spanish holders of encomiendas. Encomiendas were private grants of labor and tribute from particular indigenous communities to particular Spaniards, replacing the Aztec overlords with Spanish. In the early colonial period some indigenous governors became quite rich and influential and were able to maintain positions of power comparable to that of Spanish encomenderos. After the arrival of the Europeans in Mexico and the conquest, indigenous populations declined significantly. This was largely the result of the epidemics of viruses brought to the continent against which the natives had no immunity. In 1520–1521, an outbreak of smallpox swept through the population of Tenochtitlan and was decisive in the fall of the city; further significant epidemics struck in 1545 and 1576. Although the Aztec empire fell, some of its highest elites continued to hold elite status in the colonial era. The principal heirs of Moctezuma II and their descendants retained high status. His son Pedro Moctezuma produced a son, who married into Spanish aristocracy and a further generation saw the creation of the title, Count of Moctezuma. From 1696 to 1701, the Viceroy of Mexico was held the title of count of Moctezuma. In 1766, the holder of the title became a Grandee of Spain. In 1865, (during the Second Mexican Empire) the title, which was held by Antonio María Moctezuma-Marcilla de Teruel y Navarro, 14th Count of Moctezuma de Tultengo, was elevated to that of a Duke, thus becoming Duke of Moctezuma, with de Tultengo again added in 1992 by Juan Carlos I. Two of Moctezuma's daughters, Doña Isabel Moctezuma and her younger sister, Doña Leonor Moctezuma, were granted extensive encomiendas in perpetuity by Hernán Cortes. Doña Leonor Moctezuma married in succession two Spaniards, and left her encomiendas to her daughter by her second husband. Aztec culture and history has been central to the formation of a Mexican national identity after Mexican independence in 1821. In 17th and 18th century Europe, the Aztecs were generally described as barbaric, gruesome and culturally inferior. Even before Mexico achieved its independence, American-born Spaniards (criollos) drew on Aztec history to ground their own search for symbols of local pride, separate from that of Spain. Intellectuals utilized Aztec writings, such as those collected by Fernando de Alva Ixtlilxochitl, and writings of Hernando Alvarado Tezozomoc, and Chimalpahin to understand Mexico’s indigenous past in texts by indigenous writers. This search became the basis for what historian D.A. Brading calls "creole patriotism." Seventeenth-century cleric and scientist, Carlos de Sigüenza y Góngora acquired the manuscript collection of Texcocan nobleman Alva Ixtlilxochitl. Creole Jesuit Francisco Javier Clavijero published La Historia Antigua de México (1780–81) in his Italian exile following the expulsion of the Jesuits in 1767, in which he traces the history of the Aztecs from their migration to the last Aztec ruler, Cuauhtemoc. He wrote it expressly to defend Mexico’s indigenous past against the slanders of contemporary writers, such as Pauw, Buffon, Raynal, and William Robertson. Archeological excavations in 1790 in the capital's main square uncovered two massive stone sculptures, buried immediately after the fall of Tenochtitlan in the conquest. Unearthed were the famous calendar stone, as well as a statue of Coatlicue. Antonio de León y Gama’s 1792 Descripción histórico y cronológico de las dos piedras examines the two stone monoliths. A decade later, German scientist Alexander von Humboldt spent a year in Mexico, during his four-year expedition to Spanish America. One of his early publications from that period was Views of the Cordilleras and Monuments of the Indigenous Peoples of the Americas. Humboldt was important in disseminating images of the Aztecs to scientists and general readers in the Western world. In the realm of religion, late colonial paintings of the Virgin of Guadalupe have examples of her depicted floating above the iconic nopal cactus of the Aztecs. Juan Diego, the Nahua to whom the apparition was said to appear, links the dark Virgin to Mexico’s Aztec past. When New Spain achieved independence in 1821 and became a monarchy, the First Mexican Empire, its flag had the traditional Aztec eagle on a nopal cactus. The eagle had a crown, symbolizing the new Mexican monarchy. When Mexico became a republic after the overthrow of the first monarchy in 1822, the flag was revised showing the eagle with no crown. In the 1860s, when the French established the Second Mexican Empire under Maximilian Hapsburg, the Mexican flag retained the emblematic eagle and cactus, with elaborate symbols of monarchy. After the defeat of the French and their Mexican collaborators, the Mexican Republic was re-established, and the flag returned to its republican simplicity. This emblem has also been adopted as Mexico's national Coat of Arms, and is emblazoned on official buildings, seals, and signs. Tensions within post-independence Mexico pitted those rejecting the ancient civilizations of Mexico as source of national pride, the Hispanistas, mostly politically conservative Mexican elites, and those who saw them as a source of pride, the Indigenistas, who were mostly liberal Mexican elites. Although the flag of the Mexican Republic had the symbol of the Aztecs as its central element, conservative elites were generally hostile to the current indigenous populations of Mexico or crediting them with a glorious prehispanic history. Under Mexican president Antonio López de Santa Anna, pro-indigenist Mexican intellectuals did not find a wide audience. With Santa Anna’s overthrow in 1854, Mexican liberals and scholars interested in the indigenous past became more active. Liberals were more favorably inclined to the indigenous populations and their history, but considered a pressing matter being the "Indian Problem." Liberals’ commitment to equality before the law meant that for upwardly mobile indigenous, such as Zapotec Benito Juárez, who rose in the ranks of the liberals to become Mexico’s first president of indigenous origins, and Nahua intellectual and politician Ignacio Altamirano, a disciple of Ignacio Ramírez, a defender of the rights of the indigenous, liberalism presented a way forward in that era. For investigations of Mexico’s indigenous past, however, the role of moderate liberal José Fernando Ramírez is important, serving as director of the National Museum and doing research utilizing codices, while staying out of the fierce conflicts between liberals and conservatives that led to a decade of civil war. Mexican scholars who pursued research on the Aztecs in the late nineteenth century were Francisco Pimentel, Antonio García Cubas, Manuel Orozco y Berra, Joaquín García Icazbalceta, and Francisco del Paso y Troncoso contributing significantly to the nineteenth-century development of Mexican scholarship on the Aztecs. The late nineteenth century in Mexico was a period in which Aztec civilization became a point of national pride. The era was dominated by liberal military hero, Porfirio Díaz, a mestizo from Oaxaca who was president of Mexico from 1876 to 1911. His policies opening Mexico to foreign investors and modernizing the country under a firm hand controlling unrest, "Order and Progress," undermined Mexico’s indigenous populations and their communities. However, for investigations of Mexico’s ancient civilizations, his was a benevolent regime, with funds supporting archeological research and for protecting monuments. "Scholars found it more profitable to confine their attention to Indians who had been dead for a number of centuries." His benevolence saw the placement of a monument to Cuauhtemoc in a major traffic roundabout (glorieta) of the wide Paseo de la Reforma, which he inaugurated in 1887. In world’s fairs of the late nineteenth century, Mexico’s pavilions included a major focus on its indigenous past, especially the Aztecs. Mexican scholars such as Alfredo Chavero helped shape the cultural image of Mexico at these exhibitions. The Mexican Revolution (1910–1920) and significant participation of indigenous people in the struggle in many regions, ignited a broad government-sponsored political and cultural movement of indigenismo, with symbols of Mexico’s Aztec past becoming ubiquitous, most especially in Mexican muralism of Diego Rivera. In their works, Mexican authors such as Octavio Paz and Agustin Fuentes have analyzed the use Aztec symbols by the modern Mexican state, critiquing the way it adopts and adapts indigenous culture to political ends, yet they have also in their works made use of the symbolic idiom themselves. Paz for example critiqued the architectural layout of the National Museum of Anthropology, which constructs a view of Mexican history as culminating with the Aztecs, as an expression of a nationalist appropriation of Aztec culture. President Porfirio Díaz in 1910 at the National Museum of Anthropology with the Aztec Calendar Stone. The International Congress of Americanists met in Mexico City in 1910 on the centennial of Mexican independence. When the International Congress of Americanists was formed in Nancy, France in 1875, Mexican scholars became active participants, and Mexico City has hosted the biennial multidisciplinary meeting six times, starting in 1895. Mexico's ancient civilizations have continued to be the focus of major scholarly investigations by Mexican and international scholars. The Nahuatl language is today spoken by 1.5 million people, mostly in mountainous areas in the states of central Mexico. Mexican Spanish today incorporates hundreds of loans from Nahuatl, and many of these words have passed into general Spanish use, and further into other world languages. In Mexico, Aztec place names are ubiquitous, particularly in central Mexico where the Aztec empire was centered, but also in other regions where many towns, cities and regions were established under their Nahuatl names, as Aztec auxiliary troops accompanied the Spanish colonizers on the early expeditions that mapped New Spain. In this way even towns, that were not originally Nahuatl speaking came to be known by their Nahuatl names. In Mexico City there are commemorations of Aztec rulers, including on the Mexico City Metro, line 1, with stations named for Moctezuma II and Cuauhtemoc. Mexican cuisine continues to be based on staple elements of Mesoamerican cooking and, particularly, of Aztec cuisine: corn, chili, beans, squash, tomato, avocado. Many of these staple products continue to be known by their Nahuatl names, carrying in this way ties to the Aztec people who introduced these foods to the Spaniards and to the world. Through spread of ancient Mesoamerican food elements, particularly plants, Nahuatl loan words (chocolate, tomato, chili, avocado, tamale, taco, pupusa, chipotle, pozole, atole) have been borrowed through Spanish into other languages around the world. Through the spread and popularity of Mexican cuisine, the culinary legacy of the Aztecs can be said to have a global reach. Today Aztec images and Nahuatl words are often used to lend an air of authenticity or exoticism in the marketing of Mexican cuisine. The idea of the Aztecs has captivated the imaginations of Europeans since the first encounters, and has provided many iconic symbols to Western popular culture. In his book The Aztec Image in Western Thought, Benjamin Keen argued that Western thinkers have usually viewed Aztec culture through a filter of their own cultural interests. The Aztecs and figures from Aztec mythology feature in Western culture. The name of Quetzalcoatl, a feathered serpent god, has been used for a genus of pterosaurs, Quetzalcoatlus, a large flying reptile with a wingspan of as much as 11 metres (36 ft). Quetzalcoatl has appeared as a character in many books, films and video games. D.H. Lawrence gave the name Quetzalcoatl to an early draft of his novel The Plumed Serpent, but his publisher, Alfred A. Knopf, insisted on a change of title. American author Gary Jennings wrote two acclaimed historical novels set in Aztec-period Mexico, Aztec (1980) and Aztec Autumn (1997). The novels were so popular that four more novels in the Aztec series were written after his death. Aztec society has also been depicted in cinema. The Mexican feature film The Other Conquest (Spanish: La Otra Conquista) from 2000 was directed by Salvador Carrasco, and illustrated the colonial aftermath of the 1520s Spanish Conquest of Mexico. It adopted the perspective of an Aztec scribe, Topiltzin, who survived the attack on the temple of Tenochtitlan. The 1989 film Retorno a Aztlán by Juan Mora Catlett is a work of historical fiction set during the rule of Motecuzoma I, filmed in Nahuatl and with the alternative Nahuatl title Necuepaliztli in Aztlan. In Mexican exploitation B movies of the 1970s, a recurring figure was the "Aztec mummy" as well as Aztec ghosts and sorcerers. ^ Smith 1997, p. 4 writes "For many the term 'Aztec' refers strictly to the inhabitants of Tenochtitlan (the Mexica people), or perhaps the inhabitants of the Valley of Mexico, the highland basin where the Mexica and certain other Aztec groups lived. I believe it makes more sense to expand the definition of "Aztec" to include the peoples of nearby highland valleys in addition to the inhabitants of the Valley of Mexico. In the final few centuries before the arrival of the Spaniards in 1519 the peoples of this wider area all spoke the Nahuatl language (the language of the Aztecs), and they all traced their origins to a mythical placed called Aztlan (Aztlan is the origin of the term "Aztec," a modern label that was not used by the Aztecs themselves)"
^ Lockhart 1992, p. 1 writes "These people I call the Nahuas, a name they sometimes used themselves and the one that has become current today in Mexico, in preference to Aztecs. The latter term has several decisive disadvantages: it implies a quasi-national unity that did not exist, it directs attention to an ephemeral imperial agglomeration, it is attached specifically to the pre-conquest period, and by the standards of the time, its use for anyone other than the Mexica (the inhabitants of the imperial capital, Tenochtitlan) would have been improper even if it had been the Mexica's primary designation, which it was not"
^ The editors of the "Oxford Handbook of the Aztecs", Nichols & Rodríguez-Alegría 2017, p. 3 write: "The use of terminology changed historically during the Late Postclassic, and it has changed among modern scholars. Readers will find some variation in the terms authors employ in this handbook, but, in general, different authors use Aztecs to refer to people incorporated into the empire of the Triple Alliance in the Late Postclassic period. An empire of such broad geographic extent [...] subsumed much cultural, linguistic, and social variation, and the term Aztec Empire should not obscure that. Scholars often use more specific identifiers, such as Mexica or Tenochca, when appropriate, and they generally employ the term Nahuas to refer to indigenous people in central Mexico [...] after the Spanish Conquest, as Lockhart (1992) proposed. All of these terms introduce their own problems, whether because they are vague, subsume too much variation, are imposed labels, or are problematic for some other reason. We have not found a solution that all can agree on and thus accept the varied viewpoints of authors. We use the term Aztec because today it is widely recognized by both scholars and the international public." ^ The name of the two Aztec rulers which in this article is written as "Motecuzoma" has several variants, due to alterations to the original Nahuatl word by speakers of English and Spanish, and due to different orthographical choices for writing Nahuatl words. In English the variant "Montezuma" was originally the most common, but has now largely been replaced with "motecuhzoma" and "moteuczoma", in Spanish the term "moctezuma" which inverts the order of t and k has been predominant and is a common surname in Mexico, but is now also largely replaced with a form that respects the original Nahuatl structure, such as "motecuzoma". In Nahuatl the word is /motekʷso:ma/, meaning "he frowns like a lord" (Hajovsky 2015, pp. ix, 147:n#3). ^ Gillespie 1989 argues that the name "Motecuzoma" was a later addition added to make for a parallel to the later ruler, and that his original name was only "Ilhuicamina". ^ Some sources, including the Relación de Tula and the history of Motolinia, suggest that Atotoztli functioned as ruler of Tenochtitlan succeeding her father. Indeed no conquests are recorded for Motecuzoma in the last years of his reign, suggesting that he may have been incapable of ruling, or even dead (Diel 2005). ^ a b c d Minc 2017. ^ a b "Náhuatl: AR-Z". Vocabulario.com.mx. Archived from the original on 2012-10-17. Retrieved 2012-08-30. ^ Chimalpahin 1997, p. 73. ^ a b Barlow 1949. ^ a b León-Portilla 2000. ^ a b Carrasco 1999, p. 4. ^ Smith 1997, p. 4. ^ Nichols & Rodríguez-Alegría 2017. ^ Lockhart 1992, p. 1. ^ Smith 1997, p. 2. ^ Campbell 1997, p. 134. ^ a b Berdan & Anawalt 1997. ^ Boone 2000, pp. 242–249. ^ a b c d Batalla 2016. ^ Berdan 2014, pp. 25–28. ^ Beekman & Christensen 2003. ^ Smith 1997, p. 41-43. ^ Smith 1984, p. 173. ^ Smith 1997, pp. 44–45. ^ Townsend 2009, pp. 60–62. ^ Townsend 2009, p. 63. ^ Townsend 2009, pp. 64–74. ^ Townsend 2009, pp. 74–75. ^ Townsend 2009, pp. 78–81. ^ Smith 1997, p. 51. ^ Hassig 1988, pp. 158–159. ^ Hassig 1988, pp. 161–162. ^ a b Townsend 2009, pp. 91–98. ^ Smith 1997, p. 51-53. ^ Smith 1997, pp. 52–53. ^ Carrasco 1999, pp. 404–407. ^ Townsend 2009, p. 99. ^ Townsend 2009, pp. 99–100. ^ Townsend 2009, pp. 100–01. ^ Townsend 2009, pp. 101–10. ^ Townsend 2009, p. 110. ^ Townsend 2009, pp. 220–36. ^ Smith 2008, p. 154. ^ Noguera 1974, p. 56. ^ Smith 2008, pp. 153–54. ^ Smith 1997, pp. 152-153. ^ Lockhart 1992, pp. 14–47. ^ Townsend 2009, pp. 61–62. ^ Smith 2008, pp. 90–91. ^ Hassig 1988, pp. 17–19. ^ a b Berdan & Smith 1996b, pp. 209–216. ^ Smith 1996, p. 141-147. ^ Berdan & Smith 1996a, p. 7. ^ a b Noguera 1974. ^ Townsend 2009, pp. 171–79. ^ Townsend 2009, pp. 181–96. ^ Townsend 2009, pp. 184, 193. ^ Hirth 2016, pp. 18, 37–38. ^ Smith 1997, p. 126. ^ a b Smith 2008. ^ Smith 2008, p. 152. ^ Smith 1997, p. 196-200. ^ Smith 1997, pp. 204, 211-212, 221-222. ^ Miller & Taube 1993, p. 172. ^ Taube 1993, pp. 31–33. ^ Taube 2012, p. 745. ^ Taube 1993, pp. 41–44. ^ Taube 1993, pp. 33–37. ^ Taube 1993, pp. 44–50. ^ Hassig 2001, pp. 7–19. ^ Elson & Smith 2001. ^ a b Ortíz de Montellano 1983. ^ Ortíz de Montellano 1990. ^ Soustelle 1970, p. 66-69. ^ Berdan & Anawalt 1997, p. 116. ^ Karttunen & Lockhart 1980. ^ Montes de Oca 2013, pp. 160. ^ León-Portilla 1992, pp. 14-15. ^ Hodge et al. 1993. ^ Pasztory 1983, pp. 292–299. ^ Pasztory 1983, p. 292. ^ Berdan 1982, pp. 150–51. ^ Nowotny 2005, p. 8. ^ Nicholson & Berger 1968. ^ a b c Berdan 1982, p. 152-53. ^ Pasztory 1983, p. 278. ^ Soustelle 1970, p. 67. ^ Matthew & Oudijk 2007. ^ a b Lockhart 1992. ^ a b McCaa 1997. ^ Morfín & Storey 2016, p. 189. ^ Chipman 2005, pp. 75-95. ^ Himmerich y Valencia 1991, pp. 195-96..
^ a b Berdan & Anawalt 1997, p. 3. ^ Carrasco 2012, pp. 121-135. ^ Keen 1971, pp. 310-370. ^ Keen 1971, pp. 260–270. ^ Brading 1991, pp. 450-55. ^ Peterson 2014, pp. 176, 227. ^ Galindo Leal et al. 2017. ^ Wolfe 2000, p. 147. ^ Keen 1971, p. 336. ^ Keen 1971, p. 363. ^ a b Haugen 2009. ^ Pilcher 2017, pp. 184–185. ^ Carrasco 2012, pp. 112–120. ^ Witton, Martill & Loveridge 2010. ^ Smith, Dinitia (February 18, 1999). "Gary Jennings Is Dead at 70; Author of the Best Seller 'Aztec'". The New York Times. Retrieved 5 January 2016. ^ "Aztec series". Macmillan Publishers. ^ O'Leary, Devin D. (3 May 2007). "The Other Conquest Conquers America". Alibi. Vol. 16 no. 18. Retrieved 12 April 2018. ^ "Films on the Indigenous Peoples of Mexico. Part One: Historical Films". Native American Films. ^ Mora 2005, p. 212. Altman, Ida; Cline, Sarah; Pescador, Javier (2003). The Early History of Greater Mexico. Prentice Hall. ISBN 978-0-13-091543-6. Batalla, Juan José (2016). "The Historical Sources: Codices and Chronicles". In Deborah L. Nichols; Enrique Rodríguez-Alegría. The Oxford Handbook of the Aztecs. 1. doi:10.1093/oxfordhb/9780199341962.013.30. Berdan, Frances (1982). The Aztecs of Central Mexico: An Imperial Society. Case Studies in Cultural Anthropology. New York: Holt, Rinehart & Winston. ISBN 978-0-03-055736-1. OCLC 7795704. Berdan, Frances F.; Smith, Michael E. (1996a). "1. Introduction". In Frances Berdan; Richard Blanton; Elizabeth Hill Boone; Mary G. Hodge; Michael E. Smith; Emily Umberger. Aztec Imperial Strategies. Washington, DC: Dumbarton Oaks Research Library and Collection. ISBN 978-0-88402-211-4. OCLC 27035231. Berdan, Frances F.; Smith, Michael E. (1996b). "9. Imperial Strategies and Core-Periphery Relations". In Frances Berdan; Richard Blanton; Elizabeth Hill Boone; Mary G. Hodge; Michael E. Smith; Emily Umberger. Aztec Imperial Strategies. Washington, DC: Dumbarton Oaks Research Library and Collection. ISBN 978-0-88402-211-4. OCLC 27035231. Berdan, Frances F.; Anawalt, Patricia Rieff (1997). The Essential Codex Mendoza. University of California Press. ISBN 978-0-520-20454-6. Boone, Elizabeth Hill (2000). Stories in Red and Black: Pictorial Histories of the Aztec and Mixtec. Austin: University of Texas Press. ISBN 978-0-292-70876-1. OCLC 40939882. Brading, D.A. (1991). The First America: The Spanish Monarchy, Creole Patriots, and the Liberal State, 1492-1867. Cambridge: Cambridge University Press. ISBN 978-0-521-39130-6. Burkhart, Louise M. (1997). "Mexican women on the home front". In S Schroeder; S Wood; RS Haskett. Indian women of early Mexico. pp. 25–54. Campbell, Lyle (1997). American Indian Languages: The Historical Linguistics of Native America. Oxford Studies in Anthropoical Linguistics, 4. London and New York: Oxford University Press. ISBN 978-0-19-509427-5. OCLC 32923907. Carrasco, David (1999). City of Sacrifice: The Aztec Empire and the Role of Violence in Civilization. Boston, MA: Beacon Press. ISBN 978-0-8070-4642-5. OCLC 41368255. Cline, Howard F. (1976). "Hubert Howe Bancroft, 1832-1918". In H.F. Cline. Handbook of Middle American Indians, Guide to Ethnohistorical Sources, Part 2. pp. 326–347. ISBN 978-0-292-70153-3. Cline, Howard F. (1973). "Selected Nineteenth-Century Mexican Writers on Ethnohistory". In H.F. Cline. Handbook of Middle American Indians, Guide to Ethnohistorical Sources, Part 2. pp. 370–393. ISBN 978-0-292-70153-3. Galindo Leal, Carlos; Sarukhán Kermez, José; Wright, David; Carr, Charles (2017). "Una historia natural del emblema nacional de México". In Cora Ma. A. Falero Ruiz. Escudo Nacional: flora, fauna y biodiversidad. México City: Secretaría de Medio Ambiente y Recursos Naturales, Secretaría de Cultura, Instituto Nacional de Antropología e Historia, Museo Nacional de Antropología. pp. 42–61. Gibson, Charles (1964). The Aztecs Under Spanish Rule: A History of the Indians of the Valley of Mexico, 1519-1810. Stanford: Stanford University Press. Gillespie, Susan D. (1989). The Aztec Kings: the Construction of Rulership in Mexica History. Tucson: University of Arizona Press. ISBN 978-0-8165-1095-5. OCLC 19353576. Gillespie, Susan D. (1998). "The Aztec Triple Alliance: A Postconquest Tradition" (PDF). In Elizabeth Hill Boone; Tom Cubbins. Native Traditions in the Postconquest World, A Symposium at Dumbarton Oaks 2nd through 4th October 1992. Washington, DC: Dumbarton Oaks Research Library and Collection. pp. 233–263. ISBN 978-0-88402-239-8. OCLC 34354931. Archived from the original (PDF Reprint) on |archive-url= requires |archive-date= (help). Harner, Michael (1977). "The Ecological Basis for Aztec Sacrifice". American Ethnologist. 4 (1): 117–135. doi:10.1525/ae.1977.4.1.02a00070. Hassig, Ross (1985). Trade, Tribute, and Transportation: The Sixteenth-Century Political Economy of the Valley of Mexico. Civilization of the American Indian series. Norman: University of Oklahoma Press. ISBN 978-0-8061-1911-3. OCLC 11469622. Hassig, Ross (1988). Aztec Warfare: Imperial Expansion and Political Control. Civilization of the American Indian series. Norman: University of Oklahoma Press. ISBN 978-0-8061-2121-5. OCLC 17106411. Hassig, Ross (1992). War and Society in Ancient Mesoamerica. Berkeley: University of California Press. ISBN 978-0-520-07734-8. OCLC 25007991. Hassig, Ross (2001). Time, History, and Belief in Aztec and Colonial Mexico. Austin: University of Texas Press. ISBN 978-0-292-73139-4. OCLC 44167649. Karttunen, Frances; Lockhart, James (1980). "La estructura de la poesía náhuatl vista por sus variantes". Estudios de Cultura Nahuatl. 14: 15–64. Kaufman, Terrence (2001). "The history of the Nawa language group from the earliest times to the sixteenth century: some initial results" (PDF). Revised March 2001. Project for the Documentation of the Languages of Mesoamerica. Keen, B. (2001). "Review of: City of Sacrifice: The Aztec Empire and the Role of Violence in Civilization". The Americas. 57 (4): 593–595. doi:10.1353/tam.2001.0036. Lacadena, Alfonso (2008). "A Nahuatl Syllabary" (PDF). The PARI Journal. VIII (4). León-Portilla, Miguel (1992). Fifteen Poets of the Aztec World. Norman, Oklahoma: University of Oklahoma Press. ISBN 978-0-8061-2441-4. OCLC 243733946. León-Portilla, Miguel (2002). Bernardino de Sahagun, First Anthropologist. Mauricio J. Mixco (trans.) (Originally published as Bernardino de Sahagún: Pionero de la Antropología 1999, UNAM. ed.). Norman: University of Oklahoma Press. ISBN 978-0-8061-3364-5. OCLC 47990042. López Austin, Alfredo (2001). Aztec. The Oxford Encyclopedia of Mesoamerican Culture. 1. Oxford University Press. pp. 68–72. ISBN 978-0-19-514255-6. López Austin, Alfredo (1997). Tamoanchan, Tlalocan: Places of Mist. Mesoamerican Worlds series. Translated by Bernard R. Ortiz de Montellano; Thelma Ortiz de Montellano. Niwot: University Press of Colorado. ISBN 978-0-87081-445-7. OCLC 36178551. MacLeod, Murdo (2000). Mesoamerica since the Spanish Invasion: An Overview. The Cambridge History of the Native Peoples of the Americas. 2, part 2. Cambridge University Press. pp. 1–43. ISBN 978-0-521-65204-9. Matos Moctezuma, Eduardo (1988). The Great Temple of the Aztecs: Treasures of Tenochtitlan. New Aspects of Antiquity series. Doris Heyden (trans.). New York: Thames & Hudson. ISBN 978-0-500-39024-5. OCLC 17968786. Matos Moctezuma, Eduardo (1987). "Symbolism of the Templo Mayor". In Hill Boone, Elizabeth. The Aztec Templo Mayor. Dumbarton Oaks Research Library and Collection. pp. 188–189. McCaa, Robert (1997). "The Peopling of Mexico from Origins to Revolution (preliminary draft". Archived from the original on 2017-07-12. Retrieved 2018-02-17. Miller, Mary; Taube, Karl (1993). The Gods and Symbols of Ancient Mexico and the Maya: An Illustrated Dictionary of Mesoamerican Religion. London: Thames & Hudson. ISBN 978-0-500-05068-2. OCLC 27667317. Minc, Leah D. (2017). "Pottery and the Potter's Craft in the Aztec Heartland". In Deborah L. Nichols; Enrique Rodríguez-Alegría. The Oxford Handbook of the Aztecs. 1. Oxford University Press. doi:10.1093/oxfordhb/9780199341962.013.13. Nichols, Deborah L.; Rodríguez-Alegría, Enrique (2017). "Introduction: Aztec Studies: Trends and Themes". In Deborah L. Nichols; Enrique Rodríguez-Alegría. The Oxford Handbook of the Aztecs. Oxford University Press. Nicholson, H.B. (1971). "Major Sculpture in Pre-Hispanic Central Mexico". In Gordon F. Ekholm; Ignacio Bernal. Handbook of Middle American Indians, Volume 10 & 11 "Archaeology of Northern Mesoamerica". University of Texas Press. pp. 92–134. Nicholson, H.B. (1981). "Polychrome on Aztec Sculpture". In Elizabeth Hill Boone. Painted Architecture and Polychrome Monumental Sculpture in Mesoamerica: A Symposium at Dumbarton Oaks, 10th to 11th October, 1981. Dumbarton Oaks. Ortíz de Montellano, Bernard R. (1983). "Counting Skulls: Comment on the Aztec Cannibalism Theory of Harner-Harris". American Anthropologist. 85 (2): 403–406. doi:10.1525/aa.1983.85.2.02a00130. OCLC 1479294. Ortíz de Montellano, Bernard R. (1990). Aztec Medicine, Health, and Nutrition. New Brunswick, NJ: Rutgers University Press. ISBN 978-0-8135-1562-5. OCLC 20798977. Prem, Hanns J. (1992). "Aztec Writing". In Victoria R. Bricker; Patricia A. Andrews. Supplement to the Handbook of Middle American Indians, Vol. 5: Epigraphy. Austin: University of Texas Press. pp. 53–69. ISBN 978-0-292-77650-0. OCLC 23693597. Quiñones Keber, Eloise (1996). "Humboldt and Aztec Art". Colonial Latin American Review. 5 (2): 277–297. Sanders, William T. (1992) . "The Population of the Central Mexican Symbiotic Region, the Basin of Mexico, and the Teotihuacan Valley in the Sixteenth-century". In William Denevan. The Native Population of the Americas in 1492 (revised ed.). Madison: University of Wisconsin Press. pp. 85–150. Schroeder, Susan (1991). Chimalpahin and the Kingdoms of Chalco. Tucson: University of Arizona Press. ISBN 978-0-8165-1182-2. OCLC 21976206. Smith, Michael E. (1984). "The Aztlan Migrations of Nahuatl Chronicles: Myth or History?" (PDF). Ethnohistory. 31 (3): 153–186. doi:10.2307/482619. JSTOR 482619. OCLC 145142543. Smith, Michael E. (2000). "Aztec City-States". In Mogens Herman Hansen. A Comparative Study of Thirty City-State Cultures. Copenhagen: The Royal Danish Academy of Sciences and Letters. pp. 581–595. Smith, Michael E. (1996). "The Strategic Provinces". In Frances Berdan; Richard Blanton; Elizabeth Hill Boone; Mary G. Hodge; Michael E. Smith; Emily Umberger. Aztec Imperial Strategies. Washington, DC: Dumbarton Oaks Research Library and Collection. pp. 137–151. ISBN 978-0-88402-211-4. OCLC 27035231. Smith, Michael E.; Montiel, Lisa (2001). "The Archaeological Study of Empires and Imperialism in Pre-Hispanic Central Mexico". Journal of Anthropological Archaeology. 20 (3): 245–284. doi:10.1006/jaar.2000.0372. Smith, Michael E. (2005). "Life in the Provinces of the Aztec Empire" (PDF). Scientific American. Taube, Karl A. (1993). Aztec and Maya Myths (4th University of Texas ed.). Austin: University of Texas Press. ISBN 978-0-292-78130-6. OCLC 29124568. Taube, Karl (2012). "Creation and Cosmology:Gods and Mythic Origins in Ancient Mesoamerica". In Deborah L. Nichols; Christopher A. Pool. The Oxford Handbook of Mesoamerican Archaeology. Oxford University Press. pp. 741–752. Townsend, Richard F. (2009). The Aztecs (3rd, revised ed.). London: Thames & Hudson. ISBN 978-0-500-28791-0. Zender, Marc (2008). "One Hundred and Fifty Years of Nahuatl Decipherment" (PDF). The PARI Journal. VIII (4). Berdan, Frances F. and Patricia Reiff Anawalt (1997) The Essential Codex Mendoza. University of California Press, Berkeley. ISBN 0-520-20454-9. Cortés, Hernan (1987) Letters from Mexico. New Edition. Translated by Anthony Pagden. Yale University Press, New Haven. ISBN 0-300-03724-4. Díaz del Castillo, Bernal (1963) . The Conquest of New Spain. Penguin Classics. J.M. Cohen (trans.) (6th printing (1973) ed.). Harmondsworth, England: Penguin Books. ISBN 978-0-14-044123-9. OCLC 162351797. Durán, Diego (1971) [1574–79]. Fernando Horcasitas; Doris Heyden, eds. Book of the Gods and Rites and The Ancient Calendar. Civilization of the American Indian series. Translated by Fernando Horcasitas; Doris Heyden. Foreword by Miguel León-Portilla (translation of Libro de los dioses y ritos and El calendario antiguo, 1st English ed.). Norman: University of Oklahoma Press. ISBN 978-0-8061-0889-6. OCLC 149976. Durán, Diego (1994) [c.1581]. The History of the Indies of New Spain. Civilization of the American Indian series, no. 210. Doris Heyden (trans., annot., and introd.) (Translation of Historia de las Indias de Nueva-España y Islas de Tierra Firme, 1st English ed.). Norman: University of Oklahoma Press. ISBN 978-0-8061-2649-4. OCLC 29565779. Sahagún, Bernardino de (1950–82) [c. 1540–85]. Florentine Codex: General History of the Things of New Spain, 13 vols. in 12. vols. I–XII. Charles E. Dibble and Arthur J.O. Anderson (eds., trans., notes and illus.) (translation of Historia General de las Cosas de la Nueva España ed.). Santa Fe, NM and Salt Lake City: School of American Research and the University of Utah Press. ISBN 978-0-87480-082-1. OCLC 276351. Sahagún, Bernardino de (1997) [c. 1558–61]. Primeros Memoriales. Civilization of the American Indians series. 200, part 2. Thelma D. Sullivan (English trans. and paleography of Nahuatl text), with H.B. Nicholson, Arthur J.O. Anderson, Charles E. Dibble, Eloise Quiñones Keber, and Wayne Ruwet (completion, revisions, and editor). Norman: University of Oklahoma Press. ISBN 978-0-8061-2909-9. OCLC 35848992. Durán, Fray Diego (1994) The History of the Indies of New Spain. Translated by Doris Heyden. University of Oklahoma Press, Norman. ISBN 0-8061-2649-3. Chimalpahin, Domingo de San Antón Muñón (1997) [c. 1621]. Arthur J.O. Anderson; Susan Schroeder, eds. Codex Chimalpahin, vol. 1: society and politics in Mexico Tenochtitlan, Tlatelolco, Texcoco, Culhuacan, and other Nahua altepetl in central Mexico; the Nahuatl and Spanish annals and accounts collected and recorded by don Domingo de San Antón Muñón Chimalpahin Quauhtlehuanitzin. Civilization of the American Indian series. Translated by Arthur J.O. Anderson; Susan Schroeder. Susan Schroeder (general editor), Wayne Ruwet (manuscript editor). Norman: University of Oklahoma Press. ISBN 978-0-8061-2921-1. OCLC 36017075. Chimalpahin Quauhtlehuanitzin; Domingo de San Antón Muñón (1997) [c. 1621]. Arthur J.O. Anderson; Susan Schroeder, eds. Codex Chimalpahin, vol. 2: society and politics in Mexico Tenochtitlan, Tlatelolco, Texcoco, Culhuacan, and other Nahua altepetl in central Mexico; the Nahuatl and Spanish annals and accounts collected and recorded by don Domingo de San Antón Muñón Chimalpahin Quauhtlehuanitzin (continued). Civilization of the American Indian series. Translated by Arthur J.O. Anderson; Susan Schroeder. Susan Schroeder (general editor), Wayne Ruwet (manuscript editor). Norman: University of Oklahoma Press. ISBN 978-0-8061-2950-1. OCLC 36017075. Wikisource has the text of the 1911 Encyclopædia Britannica article Aztecs. Wikimedia Commons has media related to Aztecs. Aztecs at Mexicolore: constantly updated educational site specifically on the Aztecs, for serious students of all ages. Michael E. Smith's student bibliography on the Aztecs.